Rohilkhand University has conducted Uttar Pradesh Joint Entrance Examination (JEE B.Ed) 2019. This Exam was conducted to take admission in Two Year B.Ed Programme. Every Year this Entrance Exam conducts for Bachelor of Education (B.Ed) Course in various Government, Private, Aided Colleges. After getting Good Rank in this JEE B.Ed 2019 Exam, Candidates will be able to get Admission in Good & Desired Colleges. 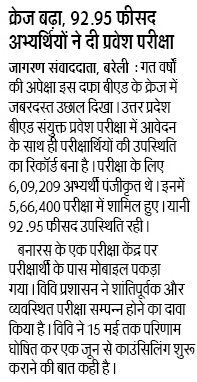 MJPRU conducted B.Ed JEE 2019 Exam on 15 April, 2019 all over the state. JEE B.Ed. 2019 was successfully conducted in two shifts on 15th April, 2019 in 1220 centres across 11 cities of the state for more than 4 lac candidates. In the first shift 209581 candidates were present and 24332 were absent. However in the second shift 210263 candidates were present while 23650 were absent. Some candidates did not appear in the first paper but reported for the second paper due to various reasons. As per the B.Ed. examination guidelines a candidate can appear in either of the test papers but the result of only those candidates would be declared who have appeared in both the papers. About UP B.Ed JEE Exam 2019 : UP JEE B.Ed Entrance Test was conducted on 1216 Centres in Uttar Pradesh. Exam was conducted in 15 Districts. On Every Centre 500 Candidates gave Exam. More than 6 Lac Candidates appeared in B.Ed JEE 2019. The B.Ed entrance examination was of Objective type and consist Two Question papers. each questions paper was of 200 Marks and Three hour of duration. Candidates who appeared B.Ed Entrance Test 2019 on 15th April, must be looking for Information of up b.ed result 2019. 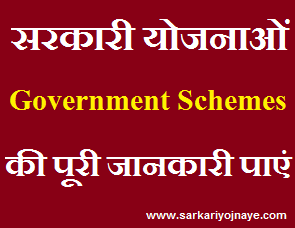 UP JEE B.Ed 2019 Exam Result is available in the month of May, 2019. Candidates will be able to Check B.Ed JEE Result, Rank, Score Card, Marks from the website (www.upbed.nic.in). Candidates who declare passed based on the Cut Off Marks decided by Lucknow University, will be eligible to take part in UP B.Ed Counseling 2019. Counseling will be based on Rank assured by Candidates in B.Ed JEE Exam 2019. At First Visit Official Rohilkhand University website/ UP B.Ed Portal (http://upbed2019.in/). On the Home Page under JEE B.Ed 2019-21 Section you will find Link to Check UP B.Ed JEE Exam Result 2019. Candidates can check their B.Ed Entrance Exam result, Score Card, Rank, Marks by Using their Credentials of Reg Id & Password/ DOB. Candidates can take a Print Out of their Result. UP B.Ed Session 2019-21 Admission Aspirants need to have regular watch on Lucknow University Website regarding Latest Updates of UP B.Ed Entrance Exam 2018. You can Bookmark this Page (CTRL+D) to get Latest Updates regarding UP B.Ed Entrance exam Result 2018. JEE B.Ed Aspirants can ask about any query related to Exam. You can leave a Message as your Query. You can also send us Email related to your Query. Can you please check my result ? Hi Ria, Result 10 PM ke baad show hone lagega. Mam 2013 wali bharti me decision aaya hai ki bs jo rit me yachi hai uska hi Medical or DV hoga or kya iske liye jo candidate yachi nahi the wo Court ja skte hai plzzzz btaye. Read Full News of UP Police Constable 2013 Court case from given link..